Fantastic Auction Result in East Geelong! 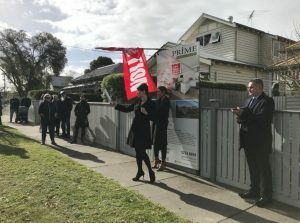 Looming wind and dark clouds weren’t enough to deter a group of eager buyers from bidding for a lovely renovated character home at 77 Normanby St East Geelong on Saturday. Set on a lovely tree-lined suburban street, the home is close to amenities and offers a convenient family lifestyle. Prospective purchasers from Melbourne and beyond, joined eager locals at the auction including younger families, couples and investors.